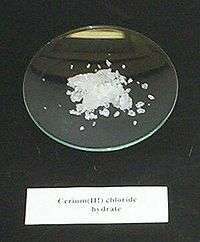 Cerium(III) chloride (CeCl3), also known as cerous chloride or cerium trichloride, is a compound of cerium and chlorine. It is a white hygroscopic solid; it rapidly absorbs water on exposure to moist air to form a hydrate, which appears to be of variable composition, though the heptahydrate CeCl3·7 H2O is known. It is highly soluble in water, and (when anhydrous) it is soluble in ethanol and acetone. Simple rapid heating of the hydrate alone may cause small amounts of hydrolysis. A useful form of anhydrous CeCl3 can be prepared if care is taken to heat the heptahydrate gradually to 140 °C (284 °F) over many hours under vacuum. This may or may not contain a little CeOCl from hydrolysis, but it is suitable for use with organolithium and Grignard reagents. Pure anhydrous CeCl3 can be made by dehydration of the hydrate either by slowly heating to 400 °C (752 °F) with 4–6 equivalents of ammonium chloride under high vacuum, or by heating with an excess of thionyl chloride for three hours. The anhydrous halide may alternatively be prepared from cerium metal and hydrogen chloride. It is usually purified by high temperature sublimation under high vacuum. Cerium(III) chloride can be used as a starting point for the preparation of other cerium salts, such as the Lewis acid, cerium(III) trifluoromethanesulfonate, used for Friedel-Crafts acylations. It is also used itself as a Lewis acid, for example as a catalyst in Friedel-Crafts alkylation reactions. Luche reduction of alpha, beta-unsaturated carbonyl compounds has become a popular method in organic synthesis, where CeCl3·7H2O is used in conjunction with sodium borohydride. For example carvone gives only the allylic alcohol 1 and none of the saturated alcohol 2. Without CeCl3, a mixture of 1 and 2 is formed. It is reported that organolithiums work more effectively in this reaction than do Grignard reagents. ↑ Several major manufacturers such as Alfa and Strem list their products simply as a "hydrate" with "xH2O" in the formula, but Aldrich sells a heptahydrate. 1 2 Paquette, L. A. (1999). Coates, R. M.; Denmark, S. E., eds. Handbook of Reagents for Organic Synthesis: Reagents, Auxiliaries and Catalysts for C-C Bond Formation. New York: Wiley. ISBN 0-471-97924-4. 1 2 3 Edelmann, F. T.; Poremba, P. (1997). Herrmann, W. A., ed. Synthetic Methods of Organometallic and Inorganic Chemistry. VI. Stuttgart: Georg Thieme Verlag. ISBN 3-13-103021-6. 1 2 3 Johnson, C. R.; Tait, B. D. (1987). "A cerium(III) modification of the Peterson reaction: methylenation of readily enolizable carbonyl compounds". Journal of Organic Chemistry. 52 (2): 281–283. doi:10.1021/jo00378a024. ISSN 0022-3263. ↑ Dimitrov, Vladimir; Kostova, Kalina; Genov, Miroslav (1996). "Anhydrous cerium(III) chloride — Effect of the drying process on activity and efficiency". Tetrahedron Letters. 37 (37): 6787–6790. doi:10.1016/S0040-4039(96)01479-7. ↑ Taylor, M. D.; Carter, P. C. (1962). "Preparation of anhydrous lanthanide halides, especially iodides". 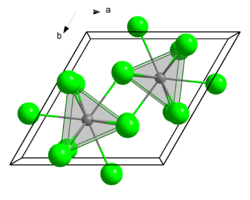 Journal of Inorganic and Nuclear Chemistry. 24 (4): 387–391. doi:10.1016/0022-1902(62)80034-7. ↑ Kutscher, J.; Schneider, A. (1971). "Notiz zur Präparation von wasserfreien Lanthaniden-Haloge-niden, Insbesondere von Jodiden". Inorg. Nucl. Chem. Lett. 7 (9): 815. doi:10.1016/0020-1650(71)80253-2. ↑ Greenwood, N. N.; Earnshaw, A. (1984). Chemistry of the Elements. New York: Pergamon Press. ISBN 0-08-022056-8. ↑ Freeman, J. H.; Smith, M. L. (1958). "The preparation of anhydrous inorganic chlorides by dehydration with thionyl chloride". Journal of Inorganic and Nuclear Chemistry. 7 (3): 224–227. doi:10.1016/0022-1902(58)80073-1. ↑ Druding, L. F.; Corbett, J. D. (1961). "Lower Oxidation States of the Lanthanides. Neodymium(II) Chloride and Iodide". Journal of the American Chemical Society. 83 (11): 2462–2467. doi:10.1021/ja01472a010. ISSN 0002-7863. ↑ Mine, Norioki; Fujiwara, Yuzo; Taniguchi, Hiroshi (1986). "Trichlorolanthanoid (LnCl3)-catalyzed Friedel-Crafts alkylation reactions". Chemistry Letters. 15 (3): 357–360. doi:10.1246/cl.1986.357. ↑ Luche, Jean-Louis; Rodriguez-Hahn, Lydia; Crabbé, Pierre (1978). "Reduction of natural enones in the presence of cerium trichloride". Journal of the Chemical Society, Chemical Communications (14): 601–602. doi:10.1039/C39780000601. CRC Handbook of Chemistry and Physics (58th edition), CRC Press, West Palm Beach, Florida, 1977. Anwander, R. (1999). Kobayashi, S., ed. Lanthanides: Chemistry and Use in Organic Synthesis. Berlin: Springer-Verlag. pp. 10–12.